Pablo Ceja, his wife Juanita, and their six children immigrated to the United States in 1967 as part of the bracero work program. They initially settled in St. Helena in the Napa Valley and later moved to Carneros, where the family grew to ten children, with all working together in the vineyards. One of the sons, Pedro, went to college and studied engineering, eventually marrying Amelia Morán Fuentes who was an immigrant from Jalisco, Mexico who had emigrated to the United States to join her father, a vineyard farmworker.. They had a dream of owning land and growing grapes and in 1983, the family pooled its resources and bought 15 acres in Carneros, planting 13 acres of Pinot Noir there in 1986. 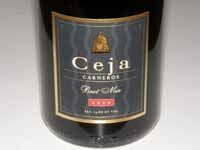 Ceja Vineyards was founded in 1999 by Pedro Ceja and his wife Amelia, and Armando Ceja and his spouse Martha. There are now three generations working in the family business. Armando Ceja is the winemaker, a graduate of the University of California at Davis in viticulture and enology, assisted by Amelia who is the much-loved public face of Ceja Vineyards, the marketing talent behind the label, and the first Mexican-American woman to open a commercial vineyard and run a winery. 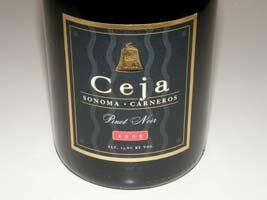 The wines are sold primarily through a mailing list (many of which are Latino) and Wine Club. A wine tasting salon, lounge and art gallery is open daily 12:00-6:00 at 1248 First Street in Napa. The nearby Bistro Sabor, masterminded by Ariel Ceja of Ceja Vineyards, specializes in pan-Latino street food (tacos, Cuban tortas, and Salvadoran pupusas) all served with a wide selection of beer, wine and sake. Saturday Night Salsa Nights are a hit where the full menu is served until 1:30 AM and dancing (salsa, merengue, cumbia and bachata) from 10:30-1:30 is free. Amelia performs videos on the web, starring in episodes of herself preparing primarily Mexican meals. Each episode features a wine that pairs with the dish.